03/20/13 BMW is recalling certain model year 2005-2008 7-series vehicles, equipped with the comfort access option, and manufactured august 23, 2004, through july 24, 2008. the affected vehicles have an electronic key and an electronic connection between the gear shifter and the transmission (shift-by-wire) that automatically shifts the transmission to park when the driver presses the start/stop button to shutdown the engine. if the driver presses the engine start/stop button 2 or 3 times within a short time interval, the system may shift the transmission to neutral rather than park. if using the electronic key (comfort access mode), there would be no protection from the ignition interlock that prevents key removal if the vehicle is not in park. 04/30/12 BMW is recalling certain model year 2011 5-series, 5-series gran turismo, model year 2012 6-series convertible, 7-series, x5 sav, and x6 sav vehicles equipped with 8- or 12-cylinder, turbocharged, engines because the circuit board for the electric auxiliary water pump can overheat. This recall is an expansion of safety recall 11v521.customers may contact the national highway traffic safety administration's vehicle safety hotline at 1-888-327-4236 (tty: 1-800-424-9153); or go to http://www.safercar.gov. 07/16/04 On certain passenger vehicles equipped with 8 and 12 cylinder engines, the digital engine management control (emc) units were not produced according to specifications. As a result, engine stalling will occur after a short period of operation. the vehicle may not be able to restart. also, a loss of power steering and, after repeated actuation of the brake pedal, a loss of brake power assist will occur. these conditions could result in a vehicle crash. Dealers will install a new digital engine management control unit. the recall began on july 16, 2004. owners should contact BMW at 1-800-831-1117. Customers can contact the national highway traffic safety administration's auto safety hotline at 1-888-dash-2-dot (1-888-327-4236). 12/31/69 BMW of north america, llc (BMW) is recalling certain 2011-2012 BMW 550i, 550i xdrive, 550i gran turismo, 550i gran turismo xdrive, 750i, 750li, 750i xdrive, 750li xdrive, 760li, x5 xdrive50i, x5 m, x6 xdrive50i, x6 m, activehybrid7, mini cooper s convertible, john cooper works (jcw) convertible, cooper s countryman, cooper s countryman all4, cooper s, jcw, cooper s clubman, jcw clubman, cooper s roadster, jcw roadster, cooper s coupe, jcw coupe and rolls-royce ghost, 2011 BMW x6 hybrid and 2012 BMW 650i coupe, 650i xdrive coupe, 650i convertible and 650i xdrive convertible vehicles. the electric auxiliary water pump may fail and cause the circuit board to overheat. 03/20/13 Engine BMW is recalling certain model year 2005-2008 7-series vehicles, equipped with the comfort access option, and manufactured august 23, 2004, through july 24, 2008. the affected vehicles have an electronic key and an electronic connection between the gear shifter and the transmission (shift-by-wire) that automatically shifts the transmission to park when the driver presses the start/stop button to shutdown the engine. if the driver presses the engine start/stop button 2 or 3 times within a short time interval, the system may shift the transmission to neutral rather than park. if using the electronic key (comfort access mode), there would be no protection from the ignition interlock that prevents key removal if the vehicle is not in park. 09/12/03 Engine On certain passenger vehicles, the engine oil filter drain plug may be insufficiently tightened. this could lead to loosening of the plug causing an initial oil spray and a subsequent oil leak. If a large amount of oil loss occurs, engine damage may result. depending on the extent of the damage, a crash could occur. Dealers will inspect the torque of the oil filter drain plug and, if necessary, retighten the drain plug with the correctly specified torque. owner notification began on september 12, 2003. owners should contact BMW at 1-800-831-1117. 07/08/03 Engine On certain passenger vehicles, due to a software error, a desynchronization of the valvetronic motors for engine banks i and ii may occur. if this occurs, the engine could stall. In those cases, the driver may not be able to restart the engine. depending on the level of engine roughness, or stalling, as well as traffic conditions and the driver's reactions, this could lead to a crash. 06/28/02 Engine On certain passenger vehicles, the electric fuel pump runs at a rotational speed that could result in reduced lubrication of its internal components. over an extended period of time, wear-induced internal damage to the fuel pump could result in insufficient fuel supply to the engine when the fuel tank contains one-third or less of its maximum fuel capacity. If this were to occur, the engine could stall and not be restarted until more fuel was added to the fuel tank. this could occur even though the fuel gauge indicated that fuel still remained in the tank. Dealers will reprogram the fuel pump control system. owner notification began june 28, 2002. owners who take their vehicles to an authorized dealer on an agreed upon service date and do not receive the free remedy within a reasonable time should contact BMW at 1-800-332-4269. 12/31/69 Engine BMW of north america, llc (BMW) is recalling certain 2011-2012 BMW 550i, 550i xdrive, 550i gran turismo, 550i gran turismo xdrive, 750i, 750li, 750i xdrive, 750li xdrive, 760li, x5 xdrive50i, x5 m, x6 xdrive50i, x6 m, activehybrid7, mini cooper s convertible, john cooper works (jcw) convertible, cooper s countryman, cooper s countryman all4, cooper s, jcw, cooper s clubman, jcw clubman, cooper s roadster, jcw roadster, cooper s coupe, jcw coupe and rolls-royce ghost, 2011 BMW x6 hybrid and 2012 BMW 650i coupe, 650i xdrive coupe, 650i convertible and 650i xdrive convertible vehicles. the electric auxiliary water pump may fail and cause the circuit board to overheat. 03/20/13 Transmission and Drivetrain BMW is recalling certain model year 2005-2008 7-series vehicles, equipped with the comfort access option, and manufactured august 23, 2004, through july 24, 2008. the affected vehicles have an electronic key and an electronic connection between the gear shifter and the transmission (shift-by-wire) that automatically shifts the transmission to park when the driver presses the start/stop button to shutdown the engine. if the driver presses the engine start/stop button 2 or 3 times within a short time interval, the system may shift the transmission to neutral rather than park. if using the electronic key (comfort access mode), there would be no protection from the ignition interlock that prevents key removal if the vehicle is not in park. 09/13/06 Suspension and Steering On certain passenger vehicles, the lower rubber mount of the rear shock absorbers may not have been manufactured to specifications and may not adhere correctly to its housing within the shock absorber. The bushing could loosen and over time could separate from its housing. the driver will experience impaired vehicle handling and control increasing the risk of a crash. Dealers will replace the rear shock absorber free of charge. the recall began on september 13, 2006. owners may contact BMW at 1-800-831-1117. 08/11/17 Electrical and Air Conditioning BMW of north america, llc (BMW) is recalling certain 2013-2015 740i, 740li, 740lxi, 750i, 750xi, 750li and 750lxi and 2014 activehybrid 7 vehicles. the affected vehicles may have received incorrect replacement left rear taillight assemblies. as such, these vehicles fail to comply with the requirements of federal motor vehicle safety standard (fmvss) number 108, "lamps, reflective devices, and associated equipment." 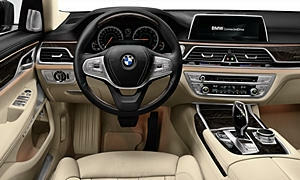 07/08/16 Electrical and Air Conditioning BMW of north america, llc (BMW) is recalling certain model year 2016 740li, 750li, and 750lxi vehicles manufactured july 1, 2015, to december 11, 2015. the affected vehicles have an air bag control module that may randomly reset due to an electrical short circuit as a result of residual metallic particles from the manufacturing process. 12/14/04 Electrical and Air Conditioning On certain passenger vehicles equipped with front seat heating systems, upon entering and exiting the vehicle, excessive contact with the side bolster that is contained in the seat's backrest may damage the heating mat located in this area. if such damage were to occur, with the system turned on, the vehicle occupant may feel excessive heat from this area. It is possible that the heating mat in the backrest's side bolster could overheat and damage, or melt a small hole in, this area of the seat cover. if this happened, it could lead to an occupant being burned. Dealers will modify the seat heating circuit. the recall is expected to begin during december 2004. owners should contact BMW at 1-800-831-1117. 02/08/18 Other BMW of north america, llc (BMW) is recalling certain 2005-2008 745i, 745li, 750i, 750li, 760i, 760li, and b7 alpina vehicles equipped with both the comfort access and soft close automatic options. in these vehicles, the doors may appear to be closed and latched, but, in fact, may inadvertently open. 12/12/12 Other BMW is recalling certain model year 2005-2007 7-series vehicles, equipped with both comfort access and soft close automatic options, and manufactured august 23, 2004, through september 3, 2007. due to a software problem, the doors may appear to be closed and latched, but, in fact, may inadvertently open. BMW will notify owners and dealers will update software. the recall began on december 12, 2012. owners may contact BMW at 1-800-525-7417 or email BMW at customerrelations@BMWusa.com. 04/16/10 Other BMW is recalling certain model year 2009-2010 7-series and model year 2010 550i grand turismo vehicles for failing to comply with the requirements of federal motor vehicle safety standard no. 110 "tire selection and rims." these vehicle's are equipped with a tire pressure label indicating that the vehicle's seating capacity is five (5) passengers. the actual seating capacity is four (4) passengers. the tire size, tire pressure, and vehicle capacity weight on the label are correct. 10/13/04 Other On certain passenger vehicles, the software programming of the driver's seat occupant detection system (ods) may not be able to reliably determine if the driver's seat is occupied. In certain crash conditions, the driver's front air bag, head protection system, safety belt pretensioner, and knee air bag may not deploy, increasing the risk of injury to a seat occupant. Dealers will reprogram the software for the driver's seat occupant detection system. the recall began october 13, 2004. owners should contact BMW at 1-800-831-1117. 03/10/01 Other Vehicle description: passenger vehicles equipped with 18-inch tires. 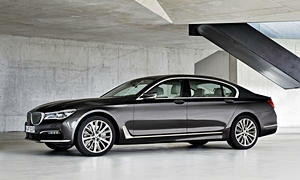 (18-inch tires are standard equipment on the m5 and optional equipment on the 7-series models). the machine used to mount and inflate the tires on the wheels at the assembly plant may have damaged the sidewall of one or more tires. the damaged area could weaken to the point where a sudden loss of air from the tire could occur. Handling and control would be drastically affected increasing the risk of a crash. Dealers will inspect the tires and if damage from the mounting machine is found, the tire will be replaced. owner notification began march 10, 2001. owners who take their vehicles to an authorized dealer on an agreed upon service date and do not receive the free remedy within a reasonable time should contact BMW at 1-800-831-1117.